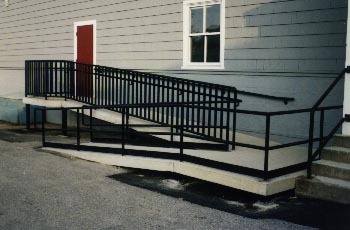 accessibility ramp that meets BOCA building code. Ramp channel sections have an outside thickness of 7" and are 54" wide. Maximum length is 15'. This ramp system provides for top landings, intermediate landings and ramp sections. Galvanized legs are supplied as part of the package. 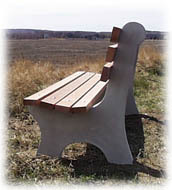 Pre-cast tapered concrete bases are available, or contractor may install his own base. Shawnee manufactures railings designed to meet BOCA codes. 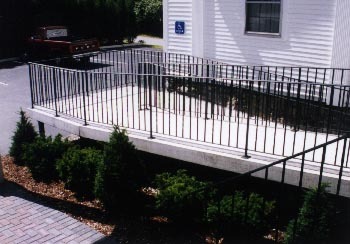 All railings are galvanized and painted prior to installation. All ramp and intermediate landings are protected from salt (snow melting chemicals) prior to delivery. Sections are available with electric de-icing cables cast into units. Cables are available in 208, 240, and 277 volts. Voltage runs between 60 and 72 watts per sq. ft.. Connection of heat units to power supply is responsibility of customer. Click here for more information on electric heat mats. • No steeper than 1" per foot. • Minimum width of 36" between railings. • Minimum dimensions of 5' x 5' when you turn a corner. • Maximum length of 30' for each ramp section. 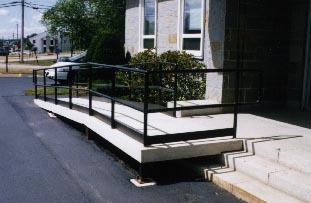 • Ramps longer than 30' require a level resting area every 30' or less. In general, if you follow the ADA's requirements, you can avoid being sued by a disabled person for non-accessibility. If you are dealing with a family member and you desire a steeper ramp, then that is your choice. Of course, you may be accepting some liability if you do not build by the codes. We recommend first going to your local building codes officer to see if he can provide any guidance. To Contact the ADA Technical Assistance Center call 1-800-949-4232.